This year’s Keen Sword exercise features a focus on amphibious operations. 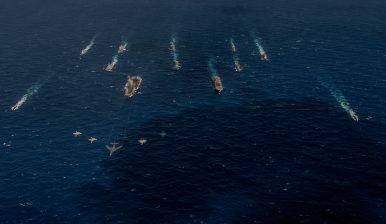 Starting Monday, the United States and Japan moved into the final phase of this year’s Keen Sword bilateral military exercise, which has been described as the “largest and most complex” exercise ever conducted by the allies. Since Keen Sword 2017, which took place in October 2016, the most recent iteration, Japan has stood up an Amphibious Rapid Deployment Brigade (ARDB), its version of a Marine Corps. The Japan Ground Self-Defense Force and Maritime Self-Defense Force have both also spent considerable time preparing for amphibious missions. Over the weekend, Japanese paratroopers were picked up and involved in the exercises by two C-130J Super Hercules aircraft. The aircraft carried them from Tsuiki Air Base in Fukuoka prefecture. The Japanese paratroopers, assisted by American personnel with the U.S. Air Force’s 374th Airlift Wing, conducted jumps over a drop zone. According to U.S. Air Force Staff Sgt. Brian Gates, the drill simulated the deliver of paratroopers to “an area without an airfield,” according to a report by Stars and Stripes. Other components of this year’s Keen Sword have been more familiar. As in previous years, a U.S. Nimitz-class supercarrier has been involved. This year, USS Ronald Reagan, the only U.S. Navy carrier to be forward-deployed with the 7th Fleet, participated. Over the weekend, naval aviators practiced maintaining a steady sortie rate of F-18 Super Hornets off the USS Ronald Reagan‘s flight deck. The United States and Japan have in recent years prepared for possible military scenarios against China in the East China Sea. Japan and China have been mired in a territorial dispute over the sovereignty of the Senkaku/Diaoyu Islands, which are administered by Japan. This year’s exercise takes place against the backdrop of a warming in relations between Tokyo and Beijing. In late-October, Japanese Prime Minister Shinzo Abe visited Beijing for a bilateral summit with Chinese President Xi Jinping, the first meeting between the leaders of the two countries on Chinese soil in seven years. Though the United States hasn’t taken a position on the sovereignty of the islands, since 2014 U.S. administrations have confirmed that because they are administered by Japan, they would fall under the ambit of the 1960 U.S.-Japan Mutual Cooperation and Security Treaty. The alliance has also prepared for other contingencies, including ones on the Korean Peninsula. This year’s Keen Sword exercises included a joint ballistic missile defense component as well, focusing on the continued ballistic missile threat posed by North Korea. Constituted in 1986, Keen Sword takes place on a biennial basis. This year’s iteration involves 57,000 troops, with 10,000 U.S. personnel joining 47,000 Japanese troops. Japan activates its equivalent of a marine unit for the first time since World War II. Japan to Study Feasibility of New Long-Range Radar Site in Western PacificWhere is the GSDF Going?Report: US to Conduct Army Tactical Missile System Test on Okinawa in 2019What the Stalled US-Korea Cost-Sharing Negotiations Mean for JapanIs Japan’s Ballistic Missile Defense Too Integrated With the US?